RadPivotGrid supports all of the three most widely used report layouts: Tabular, Outline and Compact. Outline - with this layout Row and Column Headers are separated based on their level. The indent depends on the length of the Row Headers and on the height of the Column Headers. Tabular - with this layout you will see only one row/column per item. The hierarchy from the other two layouts is "flattened" here. RowGrandTotalsPosition - defines the position of GrandTotals for all rows. You can choose between three options: Bottom (GrandTotals are shown on the last row), Top (GrandTotals are shown on the first row) or None (GrandTotals are not shown for rows). RowSubTotalsPosition - defines the position of SubTotals for each RowGroupDescription. You can choose between three options: Bottom (SubTotals are shown on the last row for each group), Top (SubTotals are shown on the first row for each group) or None (SubTotals are not shown on the rows). ColumnGrandTotalsPosition - defines the position of GrandTotals for all columns. You can choose between three options: Left (GrandTotals are shown in the first column), Right (GrandTotals are shown in the last column), None (GrandTotals are not show on the columns). 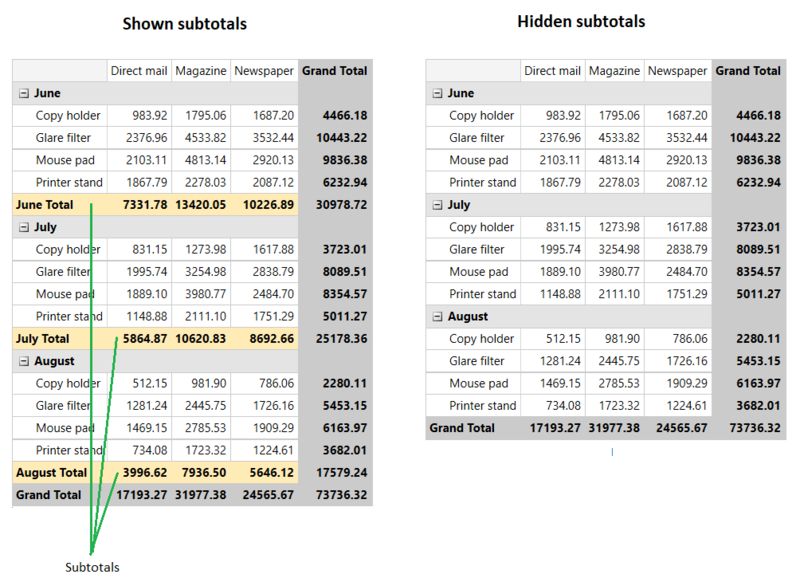 ColumnSubTotalsPosition - defines the position of SubTotals for each ColumnGroupDescription. You can choose between three options: Left (SubTotals are shown in the first column for each group), Right (SubTotals are shown in the last column for each group), None (SubTotals are not show on the columns). When you set the RowSubTotalsPosition property of the group description to a value different than None, the pivot renders the subtotals of the corresponding property group. You can alter this and hide the subtotals for a specific group via the AutoShowSubTotals property of the corresponding group description object. The show sub totals option is available also in the context menu of the group descriptions in the RadPivotFieldList control.